In 1964, George Hungerford won an Olympic gold medal for rowing. It should come as little surprise then to learn that the company in which he’s a partner, Hungerford Properties, is bringing its “A” game to commercial real estate. The Vancouver-based real estate developer is making a name for itself by taking on buildings other companies shy away from and redeveloping them into viable commercial properties. “It’s not easy the kind of investing we do,” Michael Hungerford said in an interview with Property Biz Canada. Hungerford, George’s son and a partner in the firm, said the company seeks out buildings the company can refurbish and change. The most recent example of the company’s work is its recent purchase for an undisclosed price of the Capital Place building in Edmonton. Although the Hungerford family’s roots go back six generations in the prairie city, Capital Place represent Hungerford’s first commercial real estate acquisition in the Alberta capital. Once a class-A building, Capital Place fell out of favour with the brokerage community because of deferred maintenance. For instance, the nine-storey building’s elevators often didn’t work. Tenants abandoned the building, leaving it with a 55 per cent vacancy rate. Hungerford, which was able to purchase the building for well below replacement value, is investing $6 million to modernize the structure. The electrical and elevators systems will be replaced, the parkade upgraded and the ground area façade of the building resurfaced. An enthusiastic Hunter points out that the 138,000-square-foot building, being rebranded as Ledgeview Business Centre, sits in what he calls a tremendous location. 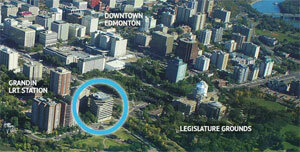 The building has views of the North Saskatchewan River Valley, is kitty-corner to the Alberta Legislature and half a block away from the light rail transit system. Back in the day, the main level pub used to be a hangout for the NHL Edmonton Oilers. Once completed, the building will have spaces for tenants ranging from 500 to 49,223 sq. ft. Ledgeview will also offer some new retail on the ground floor. Hungerford Properties is gaining a reputation for turning around such hard-to-position buildings. The company made a strong entrance into the Calgary market last year with the purchase of the Haworth Building for an undisclosed price. “To our knowledge, it was the biggest single building transaction in Canada in 2013,” Hungerford said. Hungerford is investing $15 million to divide the building for multiple tenants, reconfigure the mechanical and electrical systems and position it for what Hungerford says is long-term income generation. The bet appears to be paying off. Rolf C. Hagen Inc., a worldwide manufacturer of pet supplies, was recently announced as the building’s first tenant, taking 195,000 sq. ft. of space. Hungerford said they expect to make further announcements soon. Hungerford Properties has a couple of other projects on the go in Calgary as well. The Nexus Business Park and The NorthWing Business Park are both offering light industrial condos, spaces companies can own rather than lease. Each building offers 24 condo units for businesses and The NorthWing is already 80 per cent sold. The company also builds residential. Hungerford’s recently completed MacPherson Walk a 450 unit condo building that sold out. Altitude, another Hungerford project, is a two-tower condo development on Burnaby Mountain, with condos starting at $239,000. Hungerford Properties has three to four million sq. ft. of property across the different asset classes – Hungerford explains the figure changes month-to-month as the company expands. In the coming year, the firm plans to venture into Saskatchewan and Manitoba as well.